Yeast cells deficient in zinc and the Tsa1 protein have protein tangles. Credit: Colin MacDiarmid and David Eide, University of Wisconsin-Madison. 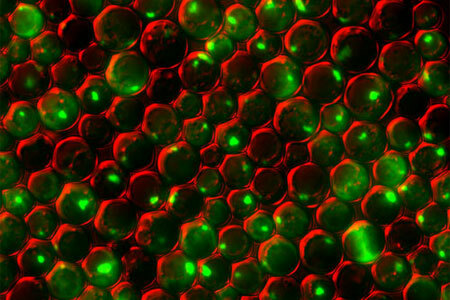 Just in time for the holidays, we’ve wrapped up a few red and green cellular images from basic research studies. In this snapshot, we see a group of yeast cells that are deficient in zinc, a metal that plays a key role in creating and maintaining protein shape. The cells also lack a protein called Tsa1, which normally keeps proteins from sticking together. Green areas highlight protein tangles caused by the double deficiency. Red outlines the cells. Protein clumping plays a role in many human diseases, including Parkinson’s and Alzheimer’s, so knowledge of why it happens—and what prevents it in healthy cells—could aid the development of treatments.